Nguyen Thai Binh Ward is like the set of a 1950s movie shot in Saigon. The area south of Quach Thi Trang Square—a ward named after a Vietnamese anti-war protestor—has escaped the new metro system’s construction zone engulfing the square and 23-9 Park. But time hasn’t entirely stood still in Nguyen Thai Binh Ward. 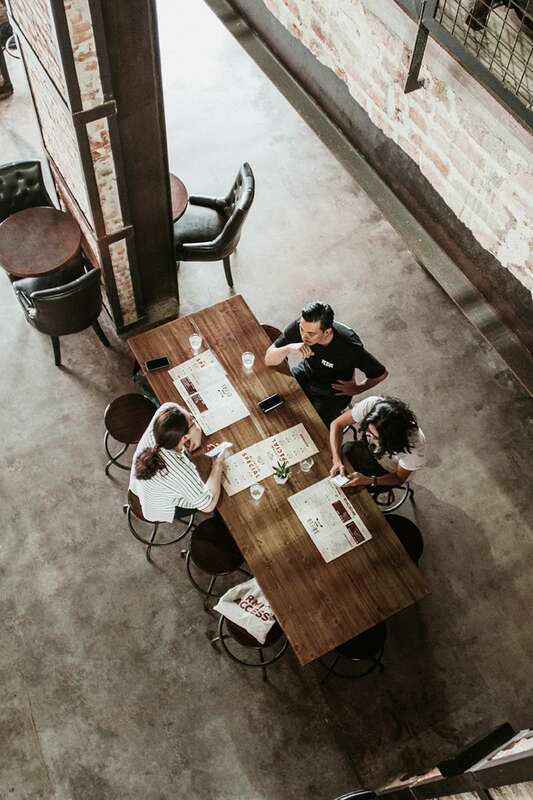 Along Calmette, cafes like Maison Marou and restaurants like Marcel Burger and Tomatito, and Quince on Ky Con, are redefining Ho Chi Minh City’s food and beverage scene with modern, innovative menus, branding, and interiors. Local resident Hoang Nam Viet is an artist and cafe owner. 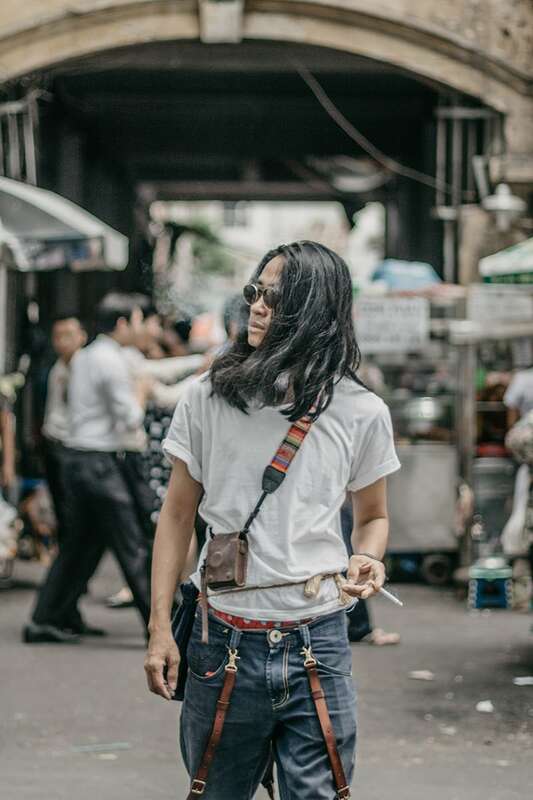 He’s shown his “evocative, physical, and ever-evolving” work at Dia Projects, Saigon Artbook 6’s “I, Me, Mine” show at The Factory Contemporary Arts Center, and at Galerie Quynh’s “Hopscotch” duo-exhibition with Do Thanh Lang. The self-taught artist often “paints the friends around him” that drift to this bohemian part of the city. His work has a draftsman’s precision and a sensuous post-impressionistic style. Artist Hoang Nam Viet whose works “undercurrent of darkness” mirrors the construction encroaching on the area around Nguyen Thai Binh Ward. 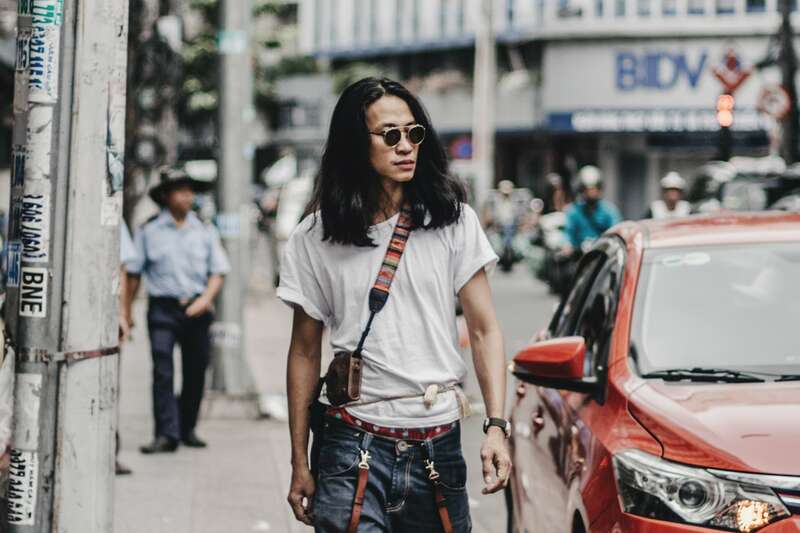 When he’s not in his studio, you might find him at his Hoang Thi Cafe—Phan Da Mua He Tan Nat—formerly on Nguyen Thai Binh Street but which has recently moved to the “stripped down” Art Deco building at 14 Ton That Dam that’s also home to Things Cafe and Snuffbox. The “undercurrent of darkness” in his recent works mirrors the encroachment of urbanization on this old part of town. So we figured Hoang Nam Viet was the perfect person to show us around. We start off along Nguyen Cong Tru Street—an area with a large population of Chinese-Vietnamese residents. For many years, locals here subsisted through parking lot businesses and food stalls serving office workers spilling out at lunchtime. From outside, the entrance gate to the alley at 158 Nguyen Cong Tru Street, where we find Biker Shield Bistro, looks imposing. From outside, the entrance gate at 158 Nguyen Cong Tru looks imposing. Following Hoang Nam Viet inside, we discover the cul-de-sac is a mix of restaurants and residential properties like the bright, spacious Biker Shield Bistro. “I guess I’m nostalgic,” Biker Shield’s owner, Nguyen Phi Linh, told the Only in Saigon video crew in 2015. 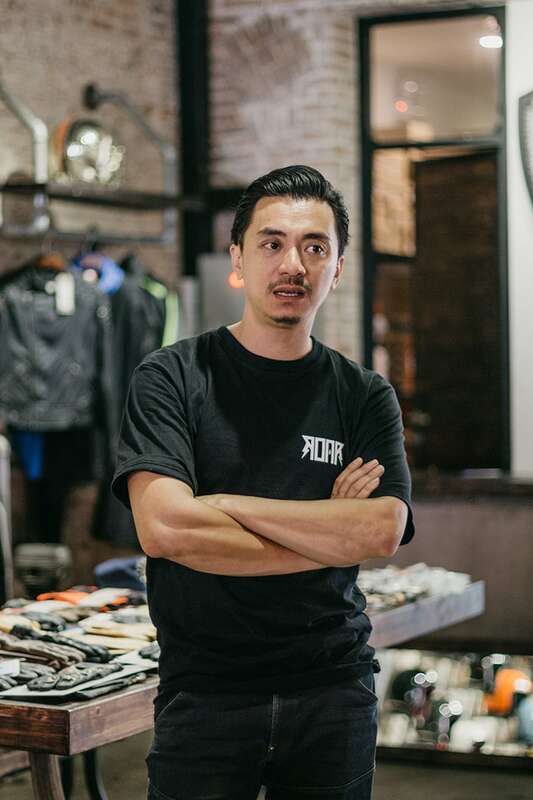 “Having my own place full of cool stuff where I can gather with my friends and customers makes me satisfied,” he had explained at his original location at 113/29 Hoa Lan, Phu Nhuan, surrounded by his collection of vintage motorbikes and helmets, and biking apparel for sale. Since then Linh has relocated and scaled up. ”Location is one of the first “wow” factors for any customer. No one expects a restaurant behind that gate in such a dilapidated residential area,” Nguyen Phi Linh tells us from his new location (158/10 Nguyen Cong Tru Street). 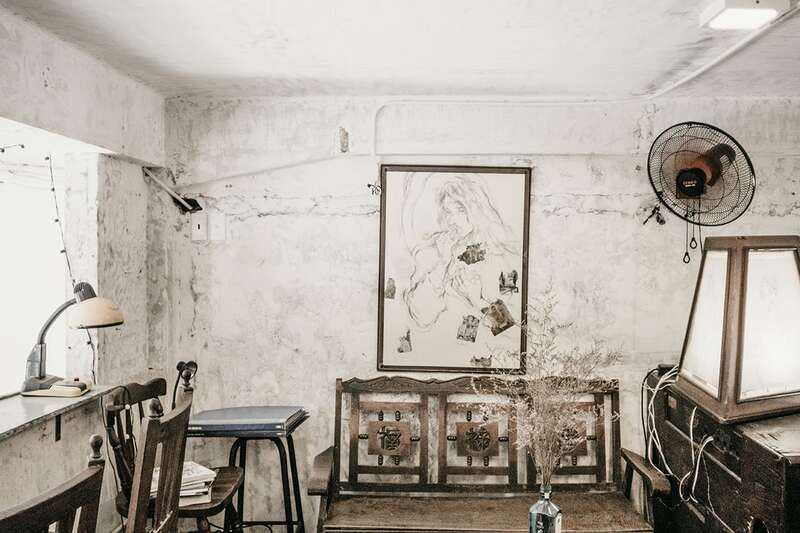 Biker Shield’s conversion of two colonial-era shophouses features exposed brickwork, wooden tables, and leather seating, and a tranquil yard out back. ”The spirit of Biker Shield is to appreciate the old.” Linh nods. The menu combines Asian and European cuisines and includes spaghetti, grilled dishes, salad, and baguettes. Biker Shield also has a diverse drink menu, with iced milk coffee, Te Te craft beer, fruit juices, and wine. Leaving Nguyen Cong Tru’s high-rise office buildings and banks behind, we walk to Le Cong Kieu Street—also popularly known as “Antique Street.” In the 1920s, this was just an alley that, at the time, was called Reims. Later, it was renamed after Le Cong Kieu, the Vietnamese Deputy General who led the revolution against French colonialism. Hoang Nam Viet in an antique shop on Le Cong Kieu Street which seems immune to the nearby hustle and bustle. 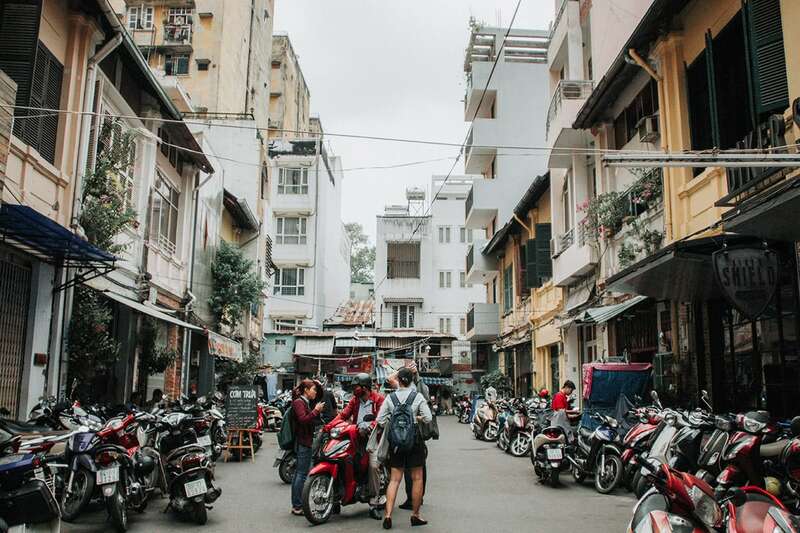 Le Cong Kieu Street is close to busy Ben Thanh Market, and crowded streets like Nguyen Thai Binh and Nam Ky Khoi Nghia Street, but it seems immune to the hustle and bustle. There are no sounds of cars, motorbike horns or the amplified voices of street vendors offering their wares. Only the scent of agarwood permeates the air. We stop in front of Pham The, the “camera wizards” at 11 Le Cong Kieu. The store was established before 1945, and today services Canons and Nikons. 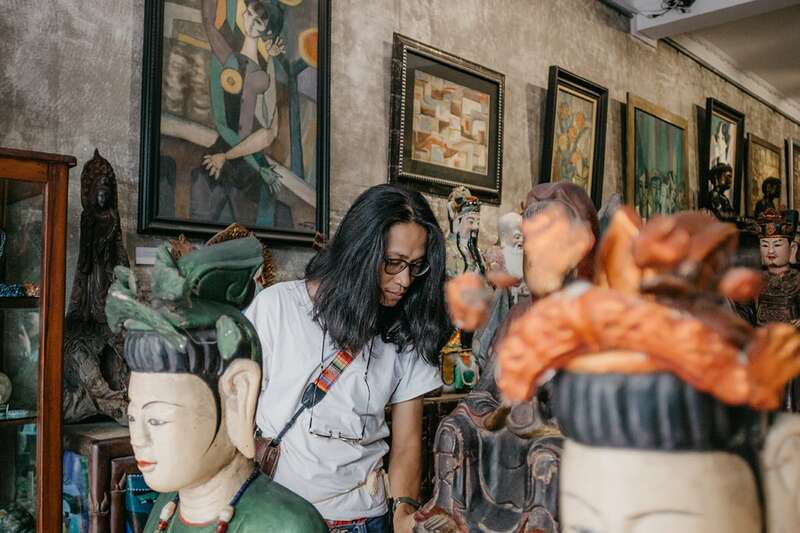 The rest of the street used to sell fine art and household goods, but now it offers a wide range of antiques—old coins, ceramics, pottery, lacquer items, Buddha statues, telephones and gramophones. There might even be some old 45s on record labels like Song Nhac, Capitol, and Continental that haven’t yet been picked over by record diggers. This 200-meter-long street is dotted with shops, each one focusing on different types of antiques. The shops, for example, at number 19, 21, 23 mainly offer pottery and wooden objects. But if you’d prefer to browse paintings, go straight to the end of the street towards the intersection with Nguyen Thai Binh Street. And despite the street’s history, many of these shops have modern, elegant, interior design, and international clientele. After half an hour on Le Cong Kieu Street we walk round the corner to the Fine Arts Museum at 97A Pho Duc Chinh Street, Nguyen Thai Binh Ward. Ho Chi Minh City Museum of Fine Arts that was once a colonial-ara mansion built between 1929 and 1934. This grand colonial-era mansion, built between 1929 and 1934, originally belonged to a Chinese businessman, familiar to local people as “Mr. 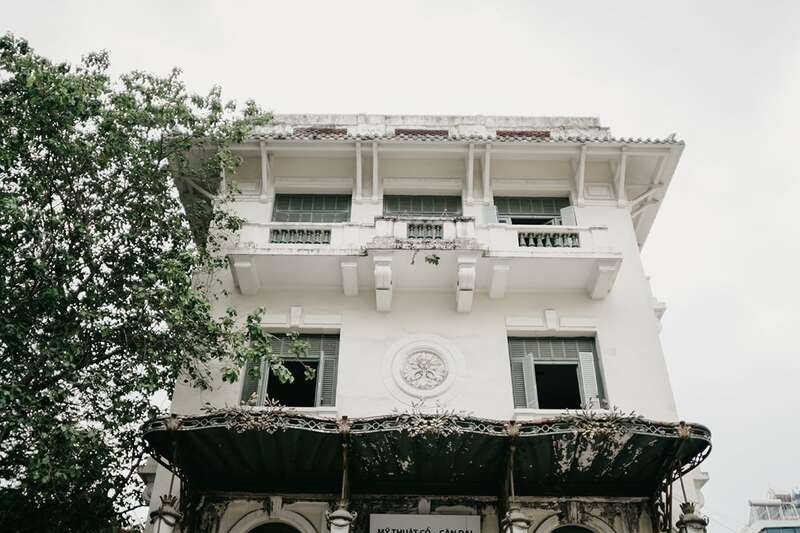 Hoa.” Appropriately, considering the Fine Art Museum building’s proximity to Antique Street, Hua Bon Hoa made his first fortune trading antiques. The Fine Arts Museum, which officially opened in 1991, belongs to the network of national museums in Vietnam. 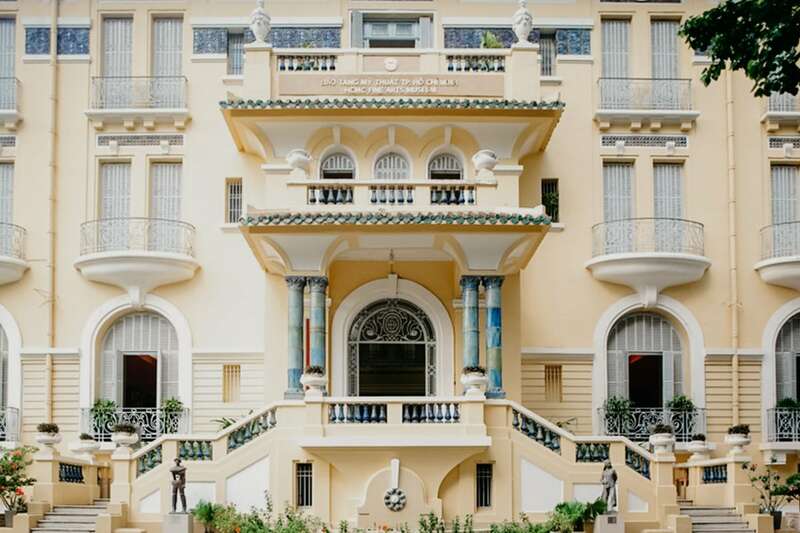 The museum collects, preserves, and exhibits “historic and contemporary artworks, archaeological and historical materials, and objects important to the history of Vietnam.” There are more than 20,000 artworks and items, from prehistory to modern times, on display. Another building in the Fine Arts complex where there are more than 20,000 artworks and items on display. The museum encompasses three buildings. The first building exhibits modern art, the second one has some artworks and artifacts by some of the most recognized Vietnamese artists. While the final building focuses on the arts from the ancient to the early-modern time, including a variety of materials like stone, pottery, wood, and bronze. We’re so engrossed in looking around that we forgot to take a lunch break. Hungry, we double back down Le Thi Hong Gam to 205-207 Calmette Street. We find a seat at the recently relocated Hainam chicken rice restaurant. Although we might have chosen Scott & Jeremy’s opened by Scott Marquis and Jeremy Choek at 40 Dang Thi Nhu Street, or La Fiesta across the street at 33 Dang Thi Nhu—or even Tomatito, Thai Street, and Marcel Burger—we opt for a regional specialty. The dish, chicken rice, is a staple in Hainanese, Singaporean, and Malaysian cuisine. In fact, CNN named it one of “the world’s 50 most delicious foods.” Thailand, where its called “khao man kai,” and Vietnam serve their own versions too. The dish is a product of the Hainanese diaspora’s influence in the region, which is quite fitting for this ward of Saigon with its Chinese influences. The dish even inspired conceptual artist Bui Cong Khanh to explore its cultural significance in a 2014 performance piece called “Chicken Rice In The Border.” Here the oily, flavorful rice is topped with chunks of tender white chicken. Finishing lunch, we walk across Nguyen Thai Binh Street to ”Yersin,” or “Dan Sinh Market,” named after the French biologist Alexandre Yersin—“Dan Sinh” is the Vietnamese pronunciation of that name. The market has four entrances on Nguyen Thai Binh, Yersin, Nguyen Cong Tru and Ky Con streets. Hoang Nam Viet on the way towards Dan Sinh market, a place to buy building materials and consumer goods, such as household hardware, electronic devices, industrial machinery and maintenance equipment. Dan Sinh Market used to be the Kim Chung area where American soldiers gambled. Local people have referred to it as Dan Sinh since the 1940s when goods sold here broke Vietnam’s import laws. Today, it is known as a place to buy building materials and consumer goods, such as household hardware, electronic devices, industrial machinery and maintenance equipment. 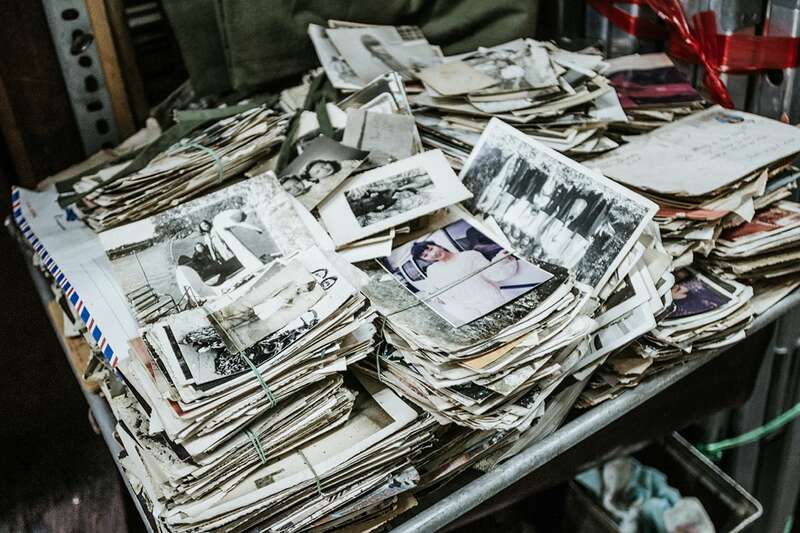 And there are a lot of unique military antiques like army uniforms, water bottles, boots, helmets from soldiers or fighter pilots, belts, lighters, compasses, or memorial items like black and white photos, badges and handwritten letters. A storefront in Yersin market where you navigate by the stalls’ numbers shown by nameplates hung on the front. In Yersin market, navigate by following the stall numbers. There will always be a nameplate hung on in front of each stall displaying its number, name and the type of products sold on it. The last destination on our itinerary around Nguyen Thai Binh Ward is Hoang Thi Cafe—Phan Da Mua He Tan Nat in the apartment building at 14 Ton That Dam. Ascending the steps feels like stepping back in time. “My mind is sometimes messy, but it’s often relaxed and tranquil…like owner, like cafe,” Viet smiles. “Customers come to Hoang Thi Cafe because they feel at home here—no stress, just gentleness and calmness,” he adds. For now, the cafe thrives on word-of-mouth. And he’s happy that way—he wants to preserve this atmosphere for the customers and friends who have taken the trouble to discover it. A corner in Hoang Thi Cafe, Hoang Nam Viet’s place to gather friends and enjoy a cup of coffee. ”Hoang Thi Cafe—Phan Da Mua He Tan Nat came out of my hobby of gathering together friends. 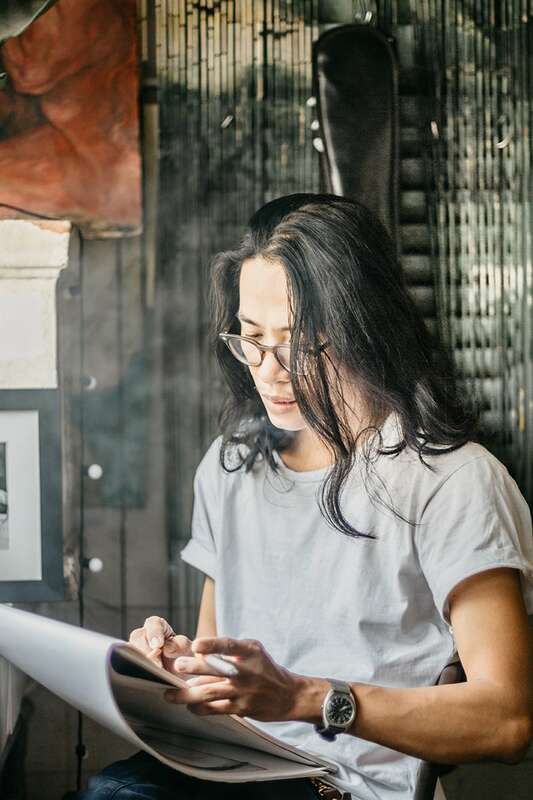 I wanted a place for them to come anytime, and enjoy a cup of coffee,” Viet explains looking around at the cafe’s homely decor that conjures up the atmosphere of bygone Vietnam. “But, I don’t think Hoang Thi Cafe is simply ‘retro.’ I didn’t apply any architectural or interior design philosophy to here. Whenever I saw anything interesting, I’d bring it home, mix it up with the other things I’ve collected, and see how they look together. If it looks good, I keep it,” Viet says. “And where did I get the name?” he asks. “‘Phan Da’ is commonly used in Chinese historical dramas and kung fu movies to describe a branch of a big organization. And ‘Mua He Tan Nat’ means the summer that was broken into pieces—a metaphor of a season that went awry. I use that name for two reasons. Firstly, it sounds poetic. But also, it reminds me of an incident that made me feel broken inside but helped me sharpen myself and become the person I am today. Even now, I still call it my ‘broken summer,’” he explains. “Everything that happens remains a part of us, even if those memories are painful sometimes…” Hoanh Nam Viet smiles before going over to speak to some friends who just arrived. “Whenever I saw anything interesting, I’d bring it home, mix it up with the other things I’ve collected, and see how they look together. 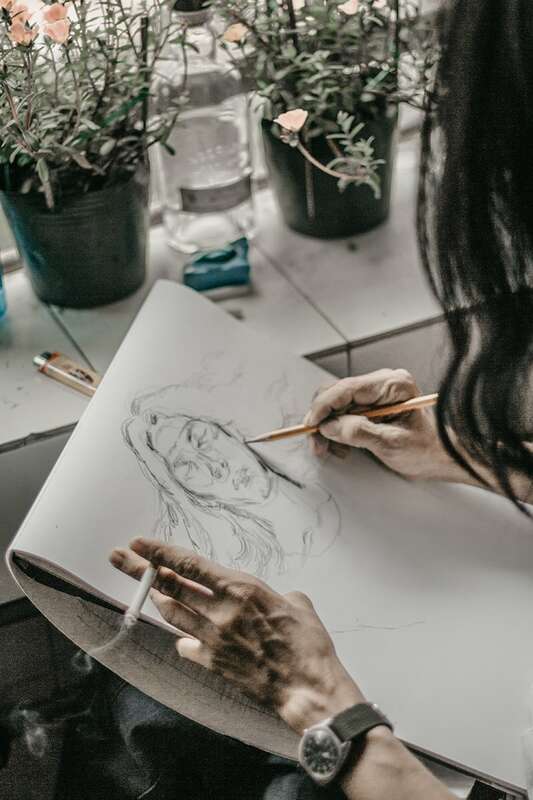 If it looks good, I keep it,” Viet says as he sketches.